Meet 'Smelly Cow' the Hereford Cow from Hilfield Herefords, well that's her nickname anyway! Her owner Mike got in touch with me through Facebook after seeing some of my work online and asked me to paint one of his cattle. Now for those of you who know me know I've got a bit of a soft spot for the gentle giants so I was thrilled when Mike got in touch. 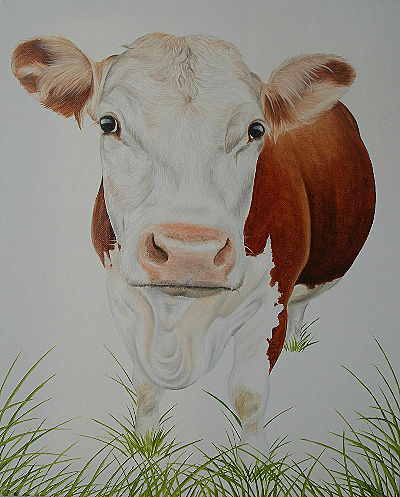 Usually my Cow paintings have a kind of silly, almost caricature style about them so it was a nice change to paint a more realistic one yet still capture her character. For any of you that are heading to the Melplash show this August I'll be there with my Moos and Mike will be there with his Hereford trade stand, so even more reason to head over and say hello.